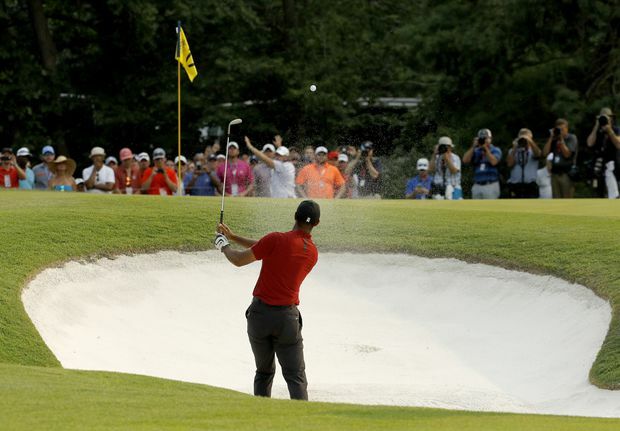 Tiger Woods hits from a bunker onto the 17th green during the final round of the PGA Championship at Bellerive Country Club on Aug. 12, 2018, in St. Louis. Woods was as dynamic as he has been all year, shot six-under 64 for the lowest final round of his career in the majors, had his lowest 72-hole score in the majors, captivated one of the largest and loudest galleries in golf and was runner-up to Brooks Koepka by two shots. Koepka, who won three of the eight majors during the qualifying period, overtook Dustin Johnson to lead the points list, and the next six players stayed the same – Justin Thomas, Patrick Reed, Bubba Watson, Jordan Spieth, Rickie Fowler and Webb Simpson. Woods was appointed a vice-captain in late February, and he has said he would like to serve two roles. He also said that when he was appointed a vice-captain for the Presidents Cup for the 2017 matches, and no one took him all that seriously. Phil Mickelson failed to qualify for the Ryder Cup for the first time since 1993, his first full season on the PGA Tour. He was 10th in the standings and missed the cut at a PGA Championship that was ripe for scoring. Mickelson has one victory over the past five years, a playoff win over Thomas in the Mexico Championship. He was not a factor in any of the majors, though he was regarded as a central figure in the team room and helped reshaped the U.S. model for the Ryder Cup. Furyk said he would be meeting with his vice-captains frequently over the next few weeks, and planned to attend two of the FedEx Cup playoff events for meetings and dinners with players already on the team, who also will have some input. That includes Woods, a vice-captain and surefire pick. Furyk said he would consider a player who gets hot, along with those whose games fit Le Golf Nacional – he considers it a second-shot course – and who meshes with other players for pairings.